As the Class of 2018 graduation approached, I had the opportunity to reflect on the MBA (FS) program, a three-year journey which offered rigorous challenges while achieving personal success. Throughout my MBA(FS) years, I met professors and classmates who left a lasting impression in my life and provided an endless amount of camaraderie as we travelled our journey together. What sparked my interest to pursue the MBA (FS) degree was somewhat unconventional. As many colleagues, mentors, leaders, and friends have taken their path through the program, it was a family legacy that truly guided me to DAL. 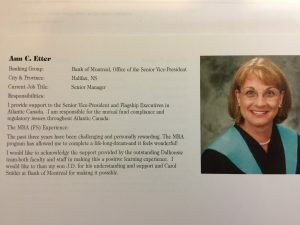 Seventeen years ago, my mother, Ann Etter, graduated from the MBA (FS) program. As a high school student at the time, we could be found doing our homework collectively at the dining room table. Her discipline in managing work, school, a home, and an emotional teenager seemed effortless. Looking back, I recognize the many challenges she faced in completing her MBA(FS). During those formative years, my identity was created, including my belief in life-long learning. I have a huge respect and appreciation for my mother’s mentorship. It is a privilege to be able to complete this program and walk in the footprints of such an accomplished woman. Applying for a graduate program was intimidating, particularly since I had been out of school and in the workforce for over a decade. Studies were stimulating and difficult but worth every second. The MBA(FS) gave me the skill-sets to recognize opportunities and participate within a complex, evolving environment. Since moving to Ontario, my journey is slightly different. I have started my own family. My wife’s enthusiastic encouragement was truly remarkable, especially given the amount of time and financial resources that were devoted to achieving my goal. I look forward to moving forward, as a family, to the next steps in life. I am proud to have Dalhousie University as my alma mater. My heritage is the East Coast of Canada; there are many in my family who are graduates of Dalhousie. As for the future, I am excited to see what it brings. With no immediate plans, health and well-being are important. 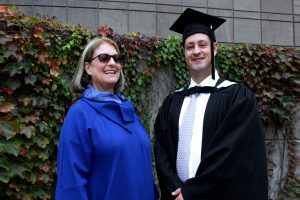 As I collected my degree, the Chancellor of Dalhousie, The Honourable A. Anne McLellan asked a profound question: if health and well-being would be for me, or for the world? I responded with an unequivocal – BOTH. I believe that question will be a guiding thought as I move forward. I will continue to dream big, read more, and always attempt to be a better derivative of myself. While the future is wide open, I can always look back, with gratitude, at the path I have travelled to help define my future. CEGE Connection is delighted to advise that John-David Etter has graciously agreed to be a repeat contributor on CEGE Connection.